Mobile Banking Core Application | Automated Systems, Inc. Mobile devices have become much more than just phones and with Insite Mobile Banking application, they can now provide the secure account access that customers need. Institutions can customize the mobile app to match the organization’s colors and branding on the external site and your bank logo will be displayed prominently throughout. Insite Mobile Banking is about more than just staying connected with your customers and a step ahead of your competitors. It is about exceeding today’s high expectations. There is always concern for security, especially when using mobile devices. Insite Mobile Banking application uses the same security certificate as the online banking applications, reducing the need to buy additional hardware or pay extra fees for a separate security certificate. Our Mobile environment also comes with integrated Touch ID bio-metric access, adding another layer of personal security. The user interface is designed to be easy to use and intuitive to both today’s savvy mobile users as well as novices. This generates confidence while still meeting the expectations of your more sophisticated customers. 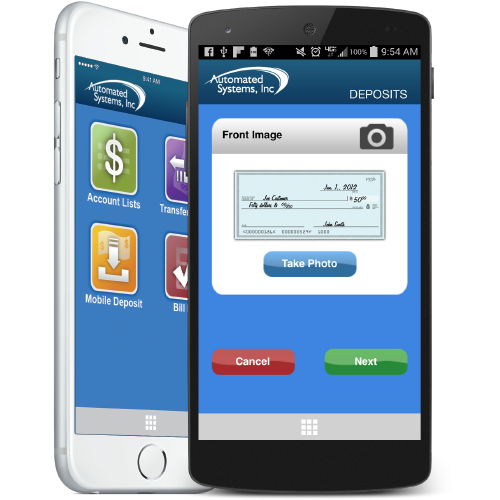 Mobile Deposit also provides the freedom to deposit checks from anywhere using the phone’s built-in camera. The checks are immediately deposited into the account in real-time. With Snap Balance, customers are able to review their balances without completely logging into their accounts by displaying their available funds as long as they hold the Snap Balance button on the login screen.